The P51D Mustang is a 100% scale R/C version of classic American combat fighter. Designed for the first time flyer to succeed at R/C flight, offering ultra stable flight characteristics. The lightweight styro-foam body coupled with a large 8.5x6 prop provide just the right amount of speed and thrust to allow the novice to master the basic mechanics of R/C flight. Each Mustang P-51D is carefully hand painted for unmatched 100% scale realism. Power comes from a powerful 300-size motor and 450 mah 11.1 volt Li-Poly battery pack with a balanced charger as a BONUS! Included is a 4 channel 2.4 Ghz dual spectrum proportional radio set with our 2.4Ghz receiver for a 4000 foot operating range; allowing you 3 Channel control :ailerons, elevator and proportional throttle control. The Mustang P-51D Features the latest in 3-D cad/cam design that allows for advanced modular construction. Main wing attaches with two bolts for a clean and scale look. Main Canopy attaches to the fuselage with undetectable magnets for a 100% scale appearance. Video Instructional Guide is included with each kit. 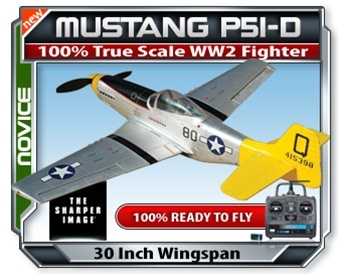 Its a simple step by step guide to ensure that your Mustang P51-D is setup right from the start. Ready to Fly! Everything Included. 100% True Scale Appearance! Re-usable Hobby Grade Components! Proportional Aileron, Elevator and Throttle Control! 2.4Ghz Radio and Receiver! !